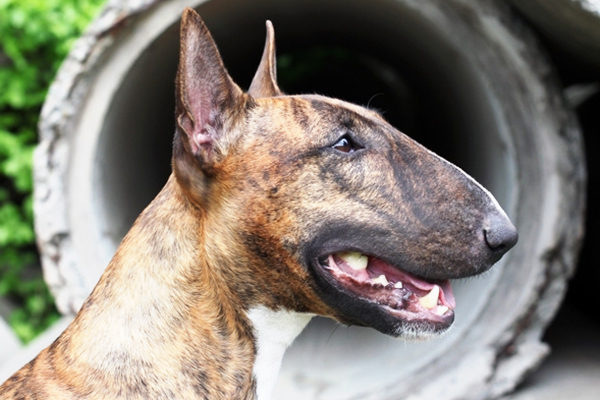 Bull Terriers can have brindle coats. Photography courtesy Mary Remer and Careen Sutch. M. Nicole Fischer photography. Bull Terrier Club of America. For those of us in the colored variety (some of us are white), brindle is a much-appreciated color. Everyone knows me for my egg-shaped head, but I’m equally celebrated for my fun-loving, good-humored nature. My English ancestors were Bulldog and Terrier mixes (thus my literal name), developed first for toughness but in time mainly for companionship. We were originally white, but at the turn of the 20th century we were back crossed with brindle Staffordshires for a colored variety. Appearance aside, my versatility is only surpassed by my enthusiasm. I’m slightly stubborn (or so you say…) with standard obedience, but I’m up for any vigorous adventure you devise. 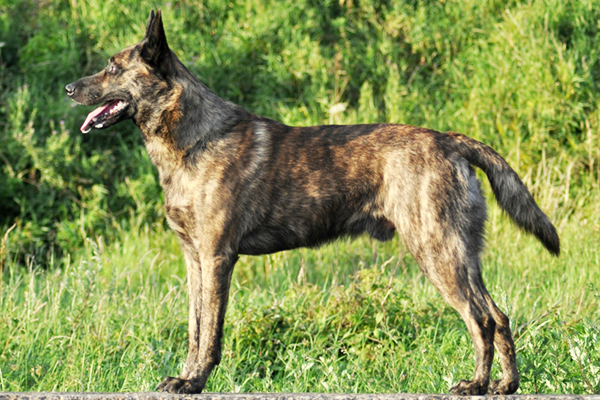 Dutch Shepherds (short hair) can be brindled dogs. Photography courtesy Moniek de Jager, American Dutch Shepherd Association. We Dutch Shepherds may have short, long or rough coats, but we are all stunning brindle-colored dogs. 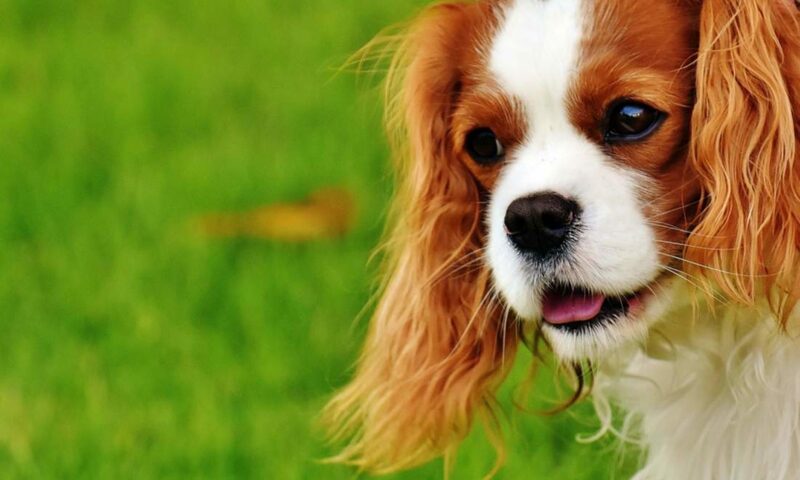 Developed in Holland as sheepdogs and all-around farm dogs, we’re faithful, reliable and active. We’ll excel in herding, but we also shine in search and rescue, obedience, protection sports, rally and agility. Perhaps you’ve seen some of my cousins from the Royal Dutch Police Dog Program (Koninklijke Nederlandse Politiehond Vereniging)? Many of these skilled police dogs are a mix of shepherd dog genes (Belgian Malinois, for example). These hard-working crossbred dogs may have different temperaments and physical appearances than us, but we share an admirable work ethic. 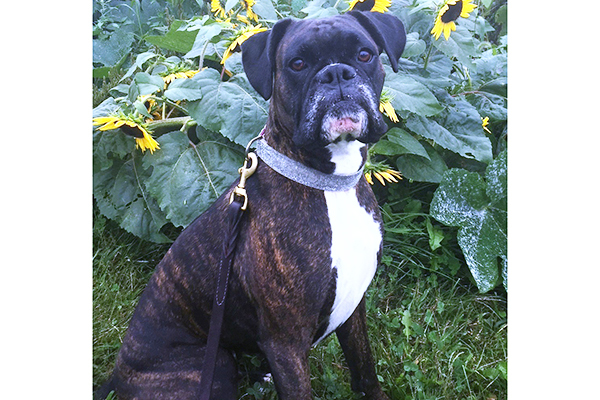 Boxers may sport brindle colors, too. Photography courtesy Robyn Ginther. My coat is either fawn or brindle colored. When I’m brindle, the stripes may be light or dark and the density of the striping ranges from narrow to thick. Initially a hunting dog, I was also used by farmers and shop owners in my home country of Germany. My work ethic is famous: in the world wars, we worked as messengers and pack-carriers. But don’t over-focus on my athleticism, work drive or courage; I have a frisky, cheery disposition and I’m apt to play the clown now and then as well. This brindled Great Dane was rescued from a puppy mill. Photography courtesy Great Danes and Friends Rescue Community and Great Babies Rescue. 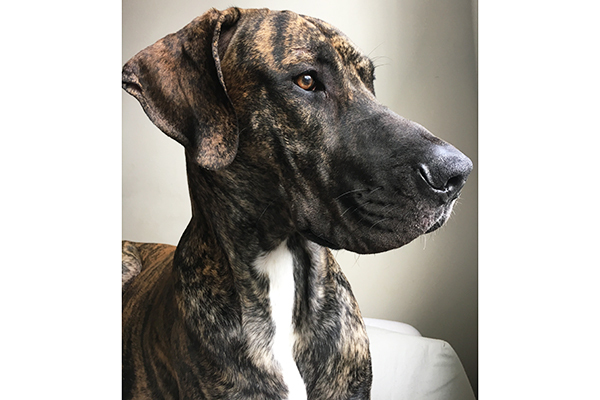 We Great Danes can be fawn, steel blue, black, harlequin or brindle-colored dogs. Of course, most humans talk more about our size than our repertoire of colors. Our females weigh 120 (or more) pounds, and our males weigh some 150 pounds. With ties to ancient mastiffs, we Deutsche Doggen were developed in late 18th and 19th century Germany to hunt boar and guard estates. While our big bark competes with our big size, we’re usually rather pleased to greet newcomers (well, unless they’re poaching on our estate I suppose!). Name aside, we weren’t developed in Denmark. Our English name derives from a French naturalist seeing us in Denmark. 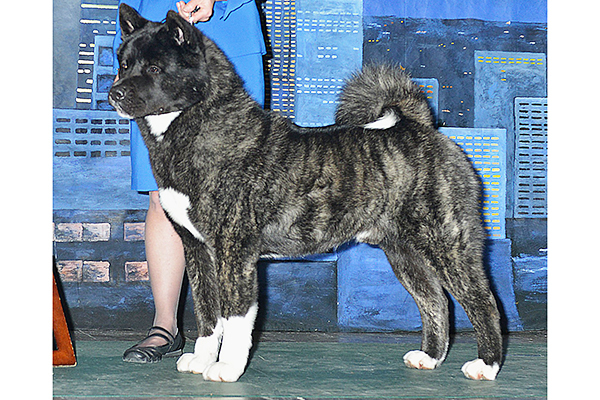 Akitas are one of the brindle dog breeds. Photography courtesy Melissa Fischer. Randy Roberts, Roberts Photos. Akita Club of America. You likely recognize one of my trademarks: my plush tail that curls over my back. Our coats can be many rich and brilliant colors, including white, brindle and pinto. Fearless, loyal and strong-minded, we were developed in Japan as a versatile, courageous hunting and guard dog. I consider myself the strong but silent type; we aren’t typically barky although we certainly keep watch over our families. Did you know we’re a natural treasure in Japan? Maybe in our families’ households here, too! Tell us: Do you own any brindle dogs? What breed is your brindle dog? 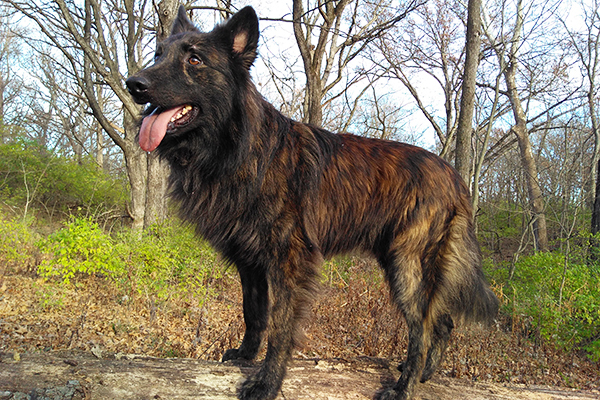 Thumbnail: Brindle Dutch Shepherd (long hair). Photography courtesy Tracy Kaecker, American Dutch Shepherd Association. The post Brindle Dogs: Meet 5 Breeds with Brindle-Colored Coats appeared first on Dogster. Next PostNext Is Your Dog Peeing a Lot? Should You Worry?